Hey wait! Wouldn't Mister T in France be Monsieur T??? And Barracuda? Is that a rewording of Baracus? I've always found the mixing of the name of the actor Mister T. with the name of his A-Team character B.A. Baracus weird. Did anyone ever mix George Peppard name with his character name of John Hannibal Smith on merchandise? I had the Blackstar figure! I usually just pretended he was Hercules to go along with my Secret Wars superhero figures. Mon Dieu! Le figure de action Inspecteur Gadget! Eet es - how you say - oh, yes - wowzairs. "I'm not rated by the Empire to fly this thing, plus I'm not wearing the right outfit. "-Says the AT-ST Driver piloting the TIE Fighter. He noticed, and he's right... The original TIE fighter design didn't have life support systems. Photo shoots of franchises are always a treat, mainly because the photographers almost never knew the slightest bit about what they were photographing. They were experts at making "a toy" look good and didn't know much about the toys themselves. If the toy vehicles were designed for toy figures, they'd reach into a prop-box, yank out some figures at random and set up the shoot. Unless a GI Joe vehicle came with a dedicated driver (and many did), just about "anyone" would be seen posed with anything. In all fairness to the photgrapher,these are fairly minor lapses. Star Wars themed bedding and curtain shoots are where his professional colleagues outdid themselves at displaying their utter indifference. TIE-Fighters were shown upside-down. X-Wings got placed vertical on their engines, canopy open, with a figure standing inside, backwards. And always the ever-present solitary football resting by the pillow or on the night stand to show it's a "boys room". Occasionally the photographer -was- familiar with the franchise and that's when the best and funniest "mistakes" would happen. Star Wars Return Of The Jedi themed chidren's room... the usual bedding and curtains. A generic teddy bear seated carefully on the bed, supported by the pillows and a stuffed Ewok slumped near one of the bed-posts, faux-neglected. Ewoks are probably the single best litmus test for adulthood in the entire classic trilogy. Little kids couldn't get enough of the creatures. There was a spin-off cartoon and even a live-action "Star Wars" TV movie which was little more than an excuse for showing them. But the older a fan got, the less charming and more annoying the ewoks became. Pointedly leaving the ewok slumped on the floor and lovingly installing a classic teddy on the bed was no accident on the photographer's part. None whatsoever. Probably the best in-joke happened with a child-sized Star Wars themed desk and chair set. Main photo showed the desk set as part of a spectacular "child's bedroom" that was larger than most middle-class living rooms. Inset photo of the desk and chair set was taken obliquely at child-height to show off two sides of the desk's graphics. On the desk, a glass of milk next to a plate with two cookies. On the chair, quite by accident, Han Solo's blaster with the barrel pointed forward. There was a photographer who loved the movie. "I've been waiting a long time for this after-school snack, Solo." Interesting coloration on the Warlock. Mine had the green wings. I'm sure there's some moderately interesting history there. I made a great playground trade back in the day based on a catalogue mismatch. One of the kids at school had received a speeder bike for his birthday as well as a Prune Face action figure. Obviously Prune Face doesn't ride a speeder bike (to be fair, none of us knew what Prune Face did because we no-one could actually spot him in Return of the Jedi. 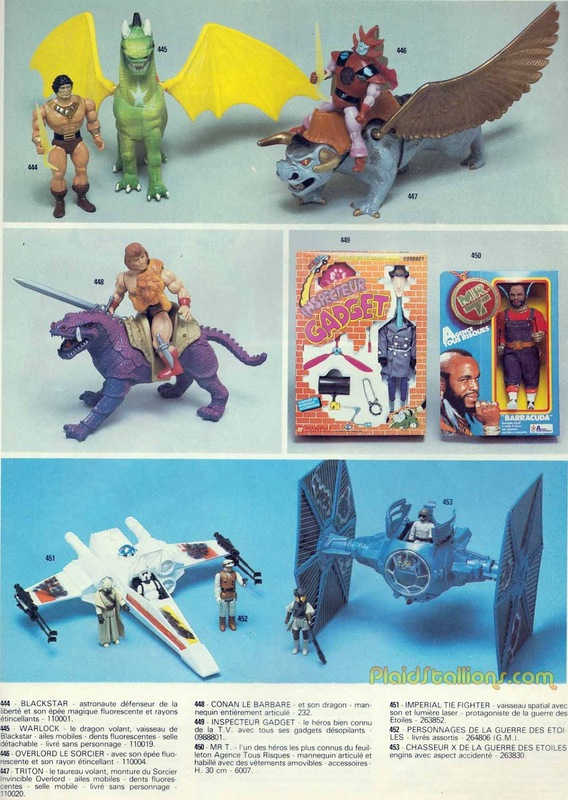 In fact, a lot of catalogues had him hanging out at Jabba's Palace). The local K-mart catalogue had advertised the speeder bike but with an AT-AT driver riding it. I happened to have a spare beat up AT-AT driver with me at school and the kid was happy to swap a mint Prune Face with all weapons and accessories for my spare AT-AT driver. He wasn't even fussed that the AT-AT driver didn't have a gun because that AT-AT driver was going to straight to the speeder bike. Still, if he was happy then fair's fair. AT-AT Driver was just what he needed. Even as a kid, I noticed a vague "split" between different SW fans. Some kids were main-character focused, others were minor-character focused. In both cases, but especially among the minor-character focused kids, some were hard sci-fi and others were soft sci-fi. The hard sci-fi kids went for the characters/ playsets/ vehicles like all the different fighters/ vehicles/ pilots from the rebel vs. imperial forces. The soft sci-fi kids overwhelmingly favored the aliens and robots. There was plenty of overlap, everybody needed Storm Troopers as heroes and villains, but it was visible even then. If you were more into the Tatooine scene like Jabba's Court and The Cantina Crowd, then Prune Face was a must-have along with Squid-Head, Ree-Yees, and so on. For what it's worth, this Anon and all his class-mates also thought Prune Face was one of Jabba's henchmen. Certainly looks the part with the eye-batch and desert robes. Turns out he's a background character in the rebel-command mission briefing. Colin P. Hunt, the actor who played the character is on the Star Wars autograph tour circuit. Star Wars was filled with "local-colour" characters like that. They didn't really do anything except look cool and they all became fantastic toys.